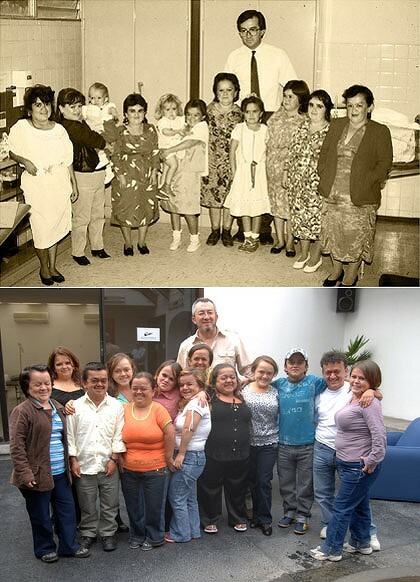 Then and now … members of the group of 99 Ecuadorians with dwarfism who took part in a 22-year study, pictured at the start of the study in 1988, above, and in 2009. A GROUP with dwarfism from a province in Ecuador could hold clues to preventing cancer. Of the 99 individuals, who are in perfect proportion except for a genetic mutation that stunts their growth, only one developed cancer during a 22-year study. Scientists researching the group believe this growth mutation is the key to their disease immunity, and suggest drugs could give a similar degree of protection to full-grown adults. An Ecuadorian endocrinologist and co-author of the study, Jaime Guevara-Aguirre, said researchers first noticed the lack of chronic disease in the community while they were investigating their growth defect. ”[We] were more in search of problems than solutions,” he said. After more than two decades of following those with Laron dwarfism, which is caused by a mutation in their growth hormone receptor gene, Dr Guevara-Aguirre and his American colleague Valter Longo found no cases of diabetes and only one non-lethal case of cancer. When they looked at the group’s normal-sized relatives, who lived in the same town over the same period, around17 per cent had been diagnosed with cancer and 5 per cent had diabetes – the same rate found among other Ecuadorian adults. The researchers concluded that growth hormone must have a downside in normal size adults. ”The growth hormone receptor-deficient people don’t get two of the major diseases of ageing,” said Associate Professor Longo, a biologist at the University of Southern California. To understand how this mutation could protect against cancer and diabetes, the researchers studied the effects of compounds in the participants’ blood. They found low levels of IGF-1 could reduce DNA damage and promote cell death when DNA damage did occur – two processes that decrease cancer-promoting behaviour in cells. The Laron group also had lower blood insulin levels, which accounted for the absence of diabetes. People with Loran dwarfism were instead more likely to die from accidents, cardiovascular disease or alcohol-related causes, the researchers found. Drugs that reduce growth hormone are readily available and are used to treat people with gigantism. The risks and benefits of giving adults these or similar drugs to reduce growth hormones would need to be weighed up against the side-effects of drugs used to treat diabetes and cancer, said Professor Longo, whose findings are published in the journal Science Translational Medicine. You are currently browsing the archives for the HEREDITARY category.